Stems usually erect or ascending, occasionally decumbent, leafy mostly in proximal 2/3 of plant, openly forked distally, 4-15 dm, basally usually glabrous or puberulent in 2 lines, rarely spreading-pubescent; distally stems usually puberulent in 2 lines, occasionally glabrate, rarely spreading glandular-pubescent. Leaves ascending at 45-80°, abruptly reduced to inflorescence; petiole 0.2-2 cm; blade green, ovate-lanceolate to ovate or triangular, 3-10 × 2-6.5 cm, usually ± thin, base obtuse, round, truncate, or cordate, apex acute to acuminate, rarely rounded, surfaces usually glabrous, sometimes puberulent or sparsely hispidulous. Inflorescences terminal and in upper axils, subumbellate clusters at ends of long, forked branches; peduncle 5-20 mm, usually pubescent with ascending, often curved, glandular or eglandular hairs, crosswalls of hairs pale; involucres pale green, often tinged pinkish, widely bell-shaped to almost rotate, 4-6 mm in flower, 8-15 mm in fruit, glabrous or glabrate but with minute curved hairs on margins, or rarely puberulent or pilose throughout, 50-90% connate, lobes ovate to broadly ovate. Flowers (2-)3(-5) per involucre; perianth usually pink to reddish purple, rarely white, 1 cm. Fruits dark grayish brown to reddish brown (ribs and tubercles usually slightly paler), narrowly obovate and tapering at both ends, 3.4-5 mm, shaggy-pubescent with spreading, sometimes tufted, hairs, 0.3-0.4 mm, sometimes also with layer of minute hairs; ribs usually irregularly and deeply notched, especially toward apex, round to bluntly angled, 0.5-0.75 times width of sulci, 0.5-1 times as wide as high; sulci with pale small to tall tubercles that are sometimes horizontally lengthened and shelflike. 2n = 58. Flowering late spring-early fall. Weedy areas in dry, often disturbed sites; 100-2200 m; Alta., B.C., Man., Ont., Que., Sask. ; Ala., Ariz., Ark., Calif., Colo., Conn., D.C., Del., Idaho, Ill., Ind., Iowa, Kans., Ky., La., Maine, Md., Mass., Mich., Minn., Mo., Mont., Nebr., Nev., N.H., N.J., N.Mex., N.Y., N.C., N.Dak., Ohio, Okla., Oreg., Pa., R.I., S.Dak., Tenn., Tex., Utah, Vt., Va., Wash., W.Va., Wis., Wyo. ; introduced in Mexico; Europe. Mirabilis nyctaginea is considered a noxious weed in some states. 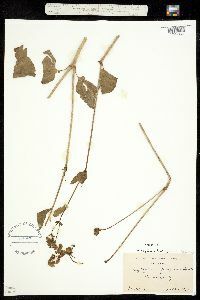 The holotype of Mirabilis ×collina Shinners is a hybrid between M. nyctaginea and M. albida. 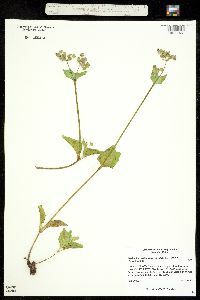 On the Great Plains, M. nyctaginea also appears to intergrade with M. albida. Prominence of the tubercles and redness of the fruits decreases in western populations. Near the Great Lakes, comparatively narrow-leaved plants with sparsely hirsute stems seem to be intergrades between M. nyctaginea and more or less hirsute M. albida. Mirabilis ×serotina Shinners is a hybrid between M. nyctaginea and M. glabra. Perennial herb 0.4 - 1.5 m tall Stem: usually erect or ascending, forked near apex, usually hairless near the base, but normally hairy in two lines further upwards. Leaves: usually only in the lower two-thirds of the plant, opposite, and ascending (at least at a forty-five degree angle) on 0.2 - 2 cm long stalks. The leaf blade is green, usually hairless, though sometimes sparsely hairy, thin, 3 - 10 cm long, 2 - 6.5 cm wide (though abruptly smaller in the inflorescence), egg-shaped to round lance-shaped or sometimes triangular, with a blunt, rounded, or heart-shaped base, and a pointed tip. Inflorescence: of several, terminal or upper axillary, almost umbel-like clusters at the ends of long, forked branches, with the clusters sitting atop 0.5 - 2 cm long, hairy stalks (the hairs ascending, often curved, sometimes glandular). Each cluster is composed of two to five flowers positioned above a green or pink-tinged, 4 - 6 mm tall, widely bell-shaped or saucer-shaped cup (involucre) formed by five fused bracts with egg-shaped tips. Flowers: pink to reddish purple, about 1 cm long and wide, radially symmetric, broadly funnel-shaped with a short, narrow tube, and five, abruptly flared lobes. Sepals: showy, not green, pink to reddish purple, and mimicking petals. The five sepals are fused at the base, constricted above the ovary into a 1 - 2 mm long, narrow tube, then separated into five, abruptly flared lobes. Petals: none. Stamens: three to five, long, and extending beyond the sepal tube. Pistil: with one, single-chambered, superior ovary; one, long, threadlike style, which extends beyond the stamens; and a rounded, head-like stigma. Fruit: a dark grayish brown to reddish brown (with more pale ridges), 3.4 - 5 mm long, narrowly inversely egg-shaped, one-seeded achene, which is subtended by the 0.8 - 1.5 cm tall bract cup (involucre). The achene tapers at both ends, has five, low, bluntly angled, longitudinal, irregularly and deeply notched ridges, with the areas between the ridges covered by pale bumps and warts. Surface covered with shaggy, spreading, sometimes tufted, 0.3 - 0.4 mm long hairs. When wet, the fruit becomes sticky and gelatinous (mucilaginous). Root: cylindric, cord-like, or thick and woody. 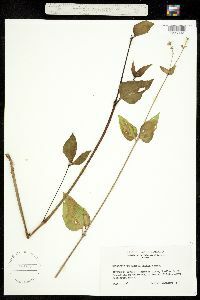 Similar species: Some narrow-leaved individuals of Mirabilis nyctaginea may be similar to M. hirsuta, but that species typically has shorter leaf stalks, and very hairy leaves and involucre bract cups. In addition, the flower clusters of that species are usually in leaf axils and loosely clustered or scattered along branches, rather than terminating distinctly forked branches. Typically M. nyctaginea has fairly wide leaves, not unlike the cultivated M. jalapa, but that species is very different due to its larger flowers with much longer tubes. Habitat and ecology: Introduced from farther west, common along railroad ballast, also along grassy roadsides, in dry pastures, and waste ground in general. Notes: This plant does not seem to regularly invade native plant communities in the Chicago Region, but in some areas of North America it can be a noxious weed. Infrequent to frequent in railroad ballast throughout the state. Probably found in every county. More frequent before the right-of-ways of railroads were kept clean. This species seems to require a very sandy soil. I have seen it only twice in situations other than railroad ballast. I once found it along a very sandy roadside near Roselawn in Newton County, and once in a very sandy, oat field near Kniman in Jasper County.